I admit it. I have a lot of jewelry. Earrings, bracelets, necklaces, the works. When I was a kid, I never got my ears pierced. Everyone I’ve ever met in my entire life has pierced ears, and I always loved the idea of having awesome earrings to accentuate an outfit. But alas, even as an adult, I still haven’t gone through with it. Recently, I started converting regular earrings into clip-ons. This has opened up the amazing, yet often frustrating, world of jewelry hoarding to me. I can’t help myself! So many years without earrings and necklaces! Anyway, with my new found love of collecting every color, size, and shape of earring under the sun, not to mention all the necklaces and bracelets, I’d noticed that the top of my dresser was no longer visible. 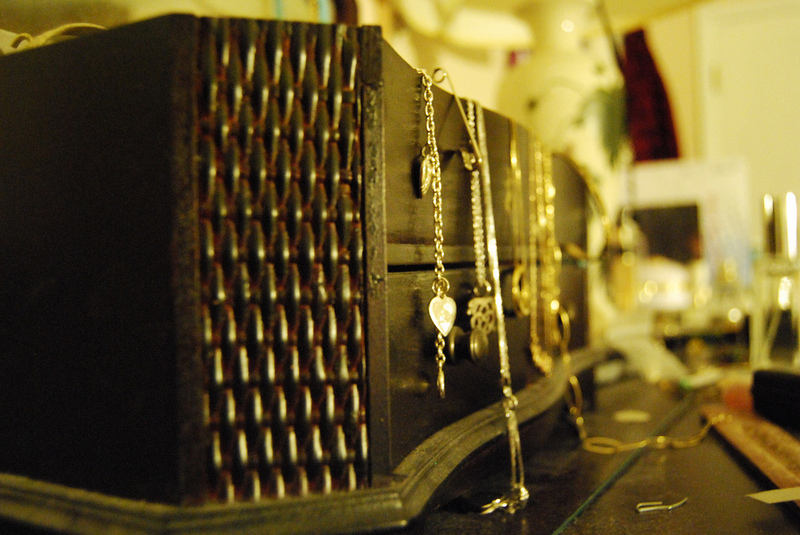 Nor was the full jewelry box I had lost somewhere underneath the newer arrivals. Then I noticed that there were pairs of earrings I couldn’t find in the clutter, so I started buying duplicates. It was becoming a vicious cycle. I decided I needed to take control. 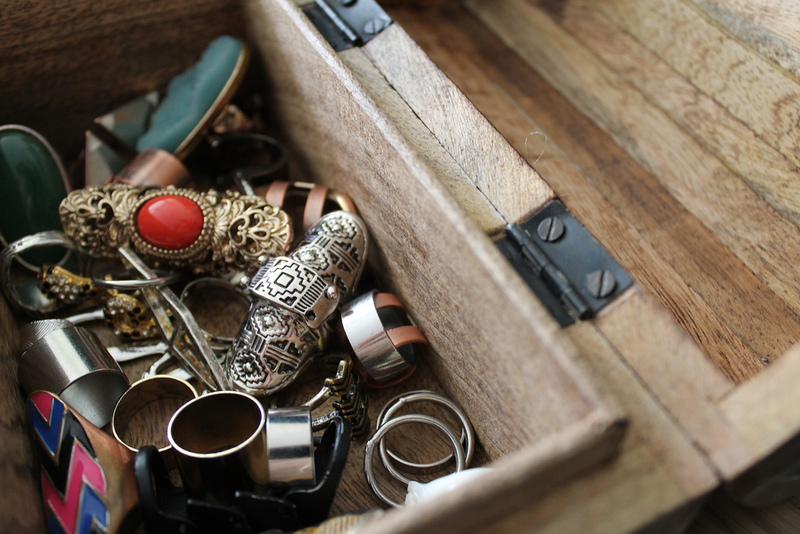 There are a lot of options out there for jewelry organization, and each one fell short of what I was looking for. Jewelry boxes (like the one buried on my dresser) were too small and it’s always so hard to sort through those little things. 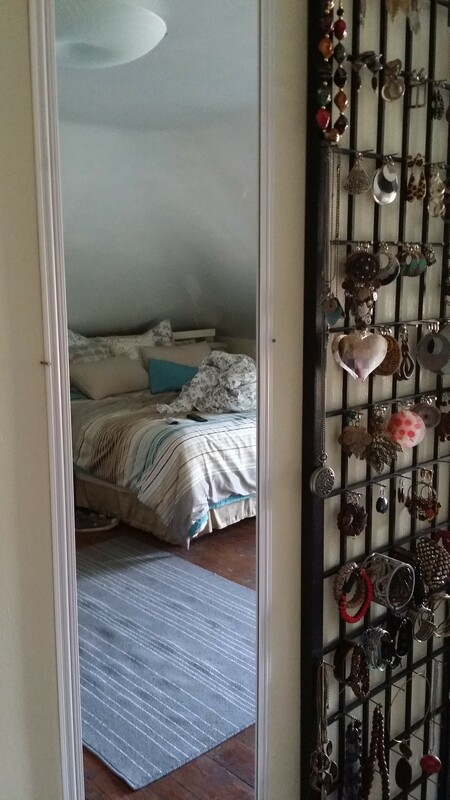 Jewelry armoires were way too big, taking up valuable floor space, nevermind the fact that they seem to only match particular decorating styles. Both options were way too expensive for my taste especially since they didn’t suit my needs 100%. Always the solution seeker and novice DIYer, I decided to go airborne. Well, not exactly airborne, but I definitely wanted to make use of the vertical wall space I had. I came up with the idea of upcycling some old, folding room dividers into the perfect storage solution. It was simple! I just took one of the panels (they usually come as a 3 or 4 panel unit), and hammered in some small nails over the entire face. I prefer Grip Rite Coated Sinker nails 4D 1-3/8″. Instant storage solution and total eye-catching wall art rolled into one. One panel can hold up to sixty five pairs of earrings! I absolutely love this thing! Previous Post Coffee, Water, or Both?